Bulk SMS Software for Android Mobile Phone helps you to send thousands of text messages simultaneously from PC using android technology based mobile phone. Text message sending program provides option to send unlimited text messages in different languages over global mobile network within minimal time. Provide easy way to communicate with your global mobile audiences. Save your valuable time for sending unlimited text messages over worldwide location. Simple to operate and cost effective sms messaging apps for android mobile phone. ✔ Send SMS directly from PC: Android sms gateway software provides option to send SMS directly from PC across the world using android technology based mobile phones. ✔ Exclusion list wizard facility: SMS messaging apps for android mobile provide exclusion list wizard facility that helps to maintain list of contacts during SMS sending procedure. ✔ Saves sent text messages details: Android sms application successfully saves your sent text messages details to txt or html file formats for future references. 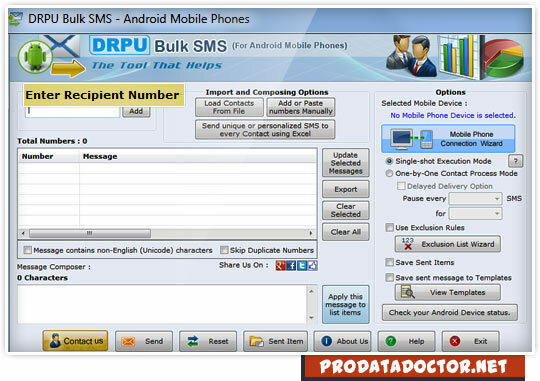 ✔ Skip duplicate phone number entries: SMS app for android mobile phone skip duplicate contact number entries while sending bulk SMS from your PC using android mobile. ✔ No internet connection is requires for sending group SMS: Android sms messaging program does not requires any internet connection to send unlimited text messages over worldwide location.